Biosis 21: Get Happy, Choosing Your Route to Healing - Gary M. Verigin, DDS, inc. Gary M. Verigin, DDS, inc. The fates seemed to be saying, “Write your column on happiness, JoAnne!” But beyond the fact that, like everyone else, I like it and crave it and try to generate as much of it as possible in my life, what do I really know about happiness? What even makes for happiness? Is it something we’re given? Is it something that just happens to lucky people? Does wealth make people happy? How about a job? Family? Or could it be that whether or not we are happy depends solely on us? Could it be that staying happy is a habit that we can form? I have read that one can change a habit and, as a result, change a life. We don’t have to think about a habit. It just happens. And you form it through repetition. In this case, it’s about practicing happiness. And this can happen through something even as simple as keeping a ̶happiness journal.” Advocates of this idea say to take some time every morning to jot down some things in your life that make you happy. That sounds like a fairly easy way to form a habit. Often what makes us happy is also very difficult. It’s sometimes difficult to write this column. I worry about what in the world I am going to say. But as I dig into the task and begin to achieve, I realize that the hard work eventually turns into joy and satisfaction – happiness. So maybe, too, the frustrations and worries that we all experience can be viewed in a new way. Maybe those things are the experiences that lead us into happiness. If so, we know that we can be happy even during the frustrating times. Happiness is an inside job. I choose it. How about you? Our daughter Lisa – the “other Dr. Verigin,” as our clients often hear JoAnne call her – recently developed a blog for our practice. A companion to this newsletter, Know Thy Health offers health news, recommended articles and websites, video and more. Its title plays on the ancient Greek aphorismgnothi seauton: know thyself. Knowledge is not only power. It is empowering. The more that people understand their bodies and the mechanisms that cause injury and illness, the more committed they become to pursuing and embracing optimum health. We thus devote ourselves to educating you about your body, how it works and how to heal it. We provide the best care and treatment possible in helping you heal. We believe in working with you as a partner, each of us learning from the other on a mutual journey toward optimum health. We are committed to helping you learn how to take the best care of yourself. The nature of our online communications draws an incredible number of visitors. Over the past few years, more than 8 of every 10 new clients find us first through our online outreach. I have constant head pain, neck and shoulder pain. I have tried chiropractic, acupuncture, myofascial release, massage. These treatments help temporarily but symptoms come back after a few days. I feel that some of my neck problems could be my jaw or the mercury fillings as I feel tension in the back of my mouth constantly. Sometimes I have difficulties talking for no apparent reason. Further, on the Mercury/Toxic Metal Sensitivity Questionnaire, she responded “yes” to 22 of 28 symptoms of mercury poisoning. This made it highly likely that her clinical symptoms may have been due in part to the presence of mercury amalgam fillings: 19 surfaces in 9 teeth. Her periodontal tissues were immaculate, as her oral hygiene efforts were exemplary. On the Kinnie-Funt (K-F) Complaint Visual Index – a questionnaire regarding the client’s head, neck and face pain – Joyce listed two major complaints: neck/shoulder pain and migraine headaches. Pain experiences ran the gamut of severity from 2 to 10 on a 1 to 10 scale (1 = least painful, 10 = most painful) on 34 different questions. Prior to clinical examination, Joyce said that she had undergone orthodontic treatment when she was 35 to relieve her TMJ problems. All four wisdom teeth and her upper bicuspids were removed before starting this therapy. She rated the therapy as successful, as the TM joint pain no longer caused discomfort. She then used retainers for 10 to 14 years but stopped when they broke. She later got a second set, but they caused the joint pain to recur. It only stopped when retainer usage stopped. 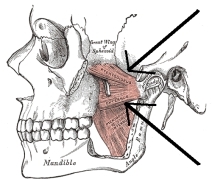 Clinical examination revealed some very noticeable TMJ issues. Though her dental clinical vertical dimension was clinically satisfactroy, revealing a 2 mm. vertical overbite demonstrated a clicking sound in the closing position on both sides at full closure. She could only open her lower jaw 33 mm. Digital palpation of the intraoral muscles such as the masseter revealed pain in both the internal and external pterygoids from 2 to 8 on the 1 to 10 scale. Anatomical sketches. 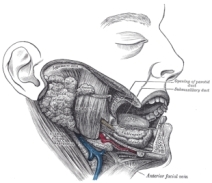 The masseter is shown in the center of the left image; the pterygoids, on the right. After reading both the offline and online information we gave her on TMJ issues, and having had a consultation about her complaints and requests, she opted not to have us further explore the TM joint issues. She said that she would be working with a variety of full body therapists in whom she had a lot of confidence. Her main request was to have all her amalgam fillings replaced. Before anything else, Joyce had a Clifford blood serum test done for dental material sensitivities to determine which restorative materials would be best suited for her treatment plan. She also had an energetic evaluation. Only after these preparatory measures did we carefully remove the mercury, one quadrant at a time, with optimum precautions taken by the standards of the IAOMT protocol for safe mercury removal (PDF). Full arch impressions were taken of each dental arch, as was a face bow transfer so the working models could be properly oriented on a semi-adjustable articulator to enhance her occlusion. Her chosen restorations consisted of one inVizion (YZ) full crown and 8 inLab Mark II inlay/onlay combinations. Once her restorations were all in place, new full arch dental impressions were taken and the working models, mounted on an articulator. Using energetic testing, we found the optimum position for her jaw and had a lower removable thermoplastic splint made to achieve that positioning. On October 3, 2007, her splint was delivered and adjusted. This is a very overdue letter to thank you for your expertise in the safe removal of my mercury fillings. When I walked into your office on June 12, 2007, I was just diagnosed with uterine cancer. Instead of having my uterus removed, I decided to have my mercury fillings replaced with a more compatible material as I felt that this could possibly be part of my health issues. Plus I had a severe shoulder & neck pain from an injury at work. It has been nearly a year now since I had my fillings changed. My mouth has never felt better & I don’t feel the constant draining from the mercury that I had prior to the change. My body is able to maintain its pH balance and my health condition is improving. I still am detoxifying the heavy metals from my body. My range of motion in my shoulder has improved. I am also able to open my mouth wider which would have been a big help while I was having my dental work done. I thank you for being patient with me. The removal of my mercury fillings was not an easy task for you and your staff. On the left, some of Joyce’s original mercury amalgam fillings; on the right, the final restorations. Our practice’s mission is to devote ourselves to educating clients about their body, how it works and how to heal it – then provide the best care and treatment possible in helping them heal. We do not throw out all the best elements of conventional school dentistry we were taught with the rest of the “bathwater.” What we do is enhance that training with the vast array of educational materials at our disposal in all disciplines of medicine and natural healing, both in this country and internationally. One nation does not control all the wisdom there is in our decision-making. We also carefully listen to our clients, their viewpoints, ideas and philosophies. We strongly acknowledge and fully appreciate that oral health, symptoms, illnesses and disease are inseparable from total-person wellness. In the above case history, the treatment plan was carefully crafted by Joyce. Though in consultation with us, of course, she was the main player. It was her body, mind and soul that eventually gave us permission to proceed as she had chosen. The sequencing of her dental work may have been radically different in another person who was provided the same opportunity to learn not just from us but all available materials. Another person might have chosen splint therapy first, followed by orthodontics/orthopedics, then amalgam removal. After that, they would work with their physicians to chelate the heavy metals and lessen the oxidative stress burden on the body. Later, they might investigate the presences of hidden infections in the bone. If found, they might choose to have the lesions sanitized through corrective surgery and integrative medical therapies. And another person might choose yet a different path. The development of a comprehensive treatment plan in the beginning is crucial. Having the client be in charge allows him or her to be treated as an individual, as well as tremendous cooperation in an atmosphere of trust whereby the client is being treated as a whole towards the goal of retoring their health to the level that they have chosen in a nonjudgmental environment. For the past 13 years, Millie Krause has assisted Dr. Verigin in providing our clients with optimal, integrated dental health care. Recently, after 30 some years total of assisting, she decided it was time to retire, wanting to spend more time with her husband on their cattle ranch. We thank her for her years of dedication and service, and we wish her the best as she moves on. So now meet the newest member of our dental health team: Stephanie Caetano. A native of Riverbank, CA, Stephanie finished her training as a Certified Dental Assistant at Modesto Junior College in 1994 and qualified as an Registered Dental Assistant in 1997. Since then, she has worked in several different dental practices and gained experience in all aspects of practice life. She is married with three children and enjoys spending her spare time reading, swimming and spending time with family. Stephanie is excited to be now working alongside Dr. Verigin and most admires his practice’s concern for the client as a whole. Looking for News of Note and Recommended Reading? They’re on Our New Blog! One of the downsides to publishing Biosis only every few months is that some online items become stale by the time the next issue comes out. So to keep you up to date, we’ve launched Know Thy Health, a blog with news, recommended articles, video, health and wellness tips and more. We update a few times each week, so be sure to bookmark the site and visit often. We’re also set to launch the revised version of our main website. The new, searchable version of our site will feature a more user-friendly newsletter archive, new bibliographies and links, video and more. These features will be live within the next couple weeks. Once you’ve had a chance to explore both the site and the blog, we’d love to know what you think.